Yesterday I wrote about my two favorite sweets from the Vegan Divas line, the brownie and the chocolate frosted cupcake. However, there were more creations to try – all with no milk, dairy or eggs. 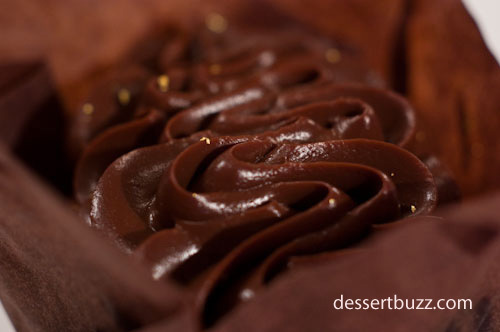 The item that got the most raves during the sample give-away at Butterfield Market was definitely the rich chocolate mousse. This is a mousse with the texture of chocolate pudding. 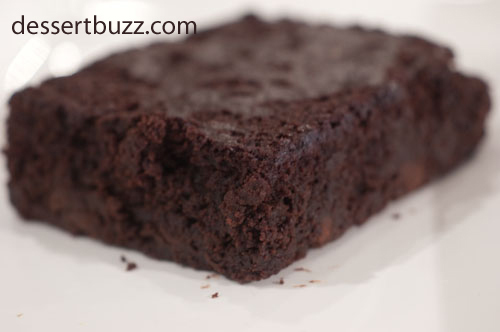 It’s made with copious amounts of dark chocolate and contains raw cocoa beans. It was so silky smooth it reminded me of a panna cotta. If I served this at a party I wouldn’t even need to tell my guests that it was vegan because they wouldn’t be able to tell the difference. Again, as with the brownie and the cupcake, this dessert is competitive not just against other vegan desserts but with full dairy desserts as well. 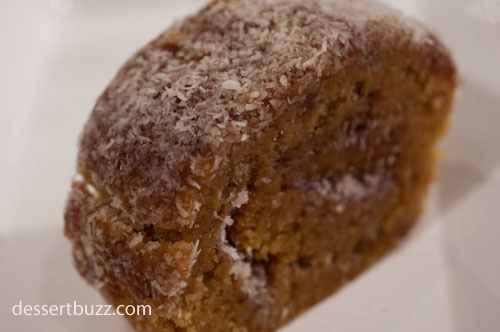 The raspberry coconut roll was one item that the Dessertbuzz team spilt on. I thought this was a very solid dessert item worthy of recommendation. The other half of the dessertbuzz team on this day, a highly experienced baker, thought the “roll” was superb and worthy of a DessertBuzz “rave”. The roll had all the hallmarks of great baked dessert: It was flavorful and very fresh and seem to be composed of fine ingediants. The coconut on the outside as well as the raspberry on the inside was also very flavorful. The baker half of DessertBuzz also thought the unique texture of the cake, which was slightly grainy rather than smooth (like the difference between an artisinal bread and Wonder) was what made the dessert special. Ultimately, we both liked the roll quite a bit. 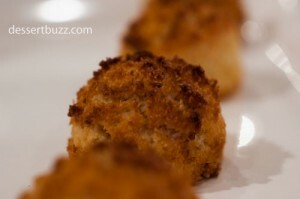 The Vegan Divas coconut macaroons were superior to any full butter-and-egg-containing macaroons I have tried. If all macaroons tasted like these they would be as ubiquitous as chocolate chip cookies. To be clear, I am not comparing these to the macaroons that come in a sealed container around the Jewish holidays. I am comparing them to other short-shelf-life, flour-less, packaged cookies such as those found at Zabars. 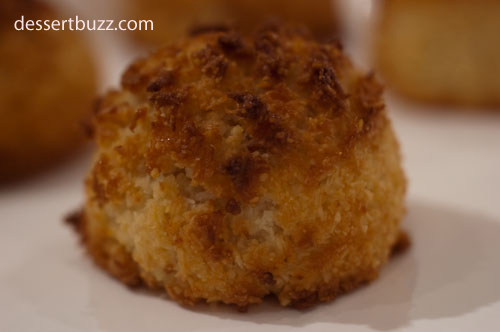 The main difference with these macaroons is that they were very light but about twice as flavorful as normal macaroons. They contain no flour and are made with arrowroot (a starch many chefs use as a thickener). For example, if you ate the whole container of 4 (that might happen) you wouldn’t feel like too much of a pig. 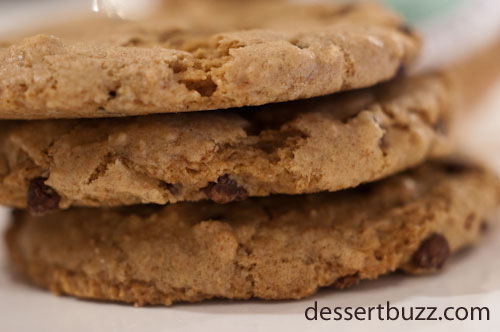 Finally, the DessertBuzz team was not able to try the dark chocolate chocolate chip cookies but were able to try the standard chocolate chip cookies. These were good but not in the class of the other items. That is, not as good as a Levain or Jacques Torres cookie. Ultimately, I was surprised that seven-out-of-eight of the items DessertBuzz tried from Vegan Divas was as good or better than the best non-vegan version. Just the fact that Payard and Butterfield were going to carry the lines in their stores should have tipped me off. Part I of this review is here. Three of the items, the raspberry coconut roll, coconut macaroons and oatmeal raisin cookies will be available at Francois Chocolate Bar, 714 Madison Ave, 4th floor (212) 759-1600. The Vegan Divas web site is here. 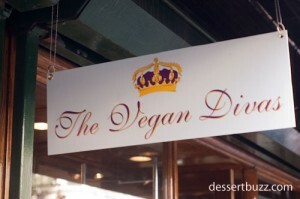 It’s great to know that now we have more options to eat quality food and vegan in NYC! Can’t wait to try the brownie! People who don’t want to try vegan desserts are fools. J/k kind of. @Sue, So many normally open-minded people give me the most extreme reactions when I tell them about how good some of these desserts are. It’s really crazy. Yes, I so totally agree that the macaroons are decadent and if I had the whole container I’d probably eat all four…I have tried most of the Vegan Diva treats the next one I am planning on trying is the Raspberry Coconut Roll which looks delicious!